Synapsy researchers reveal the developmental function of a new schizophrenia (SZ) risk-gene. The candidate SZ-risk gene DGCR2 is located in the 22q11.2 locus, whose deletion is a major risk factor for SZ. 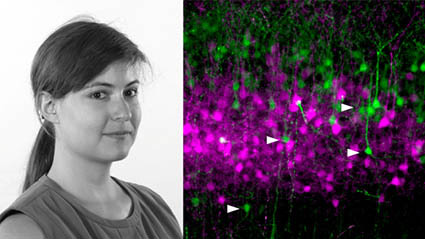 In a recent paper published in Biological Psychiatry, Aude Molinard-Chenu, former MD-PhD Synapsy student in the lab of Alexandre Dayer, shows that Dgcr2 regulates neuronal migration, a critical step in cortical development. In addition, researchers identify key molecular pathways involved in this process and demonstrate that a human SZ-risk mutation in DGCR2 has a pathogenic impact on cortical formation. Overall, this work further strengthens the hypothesis that altered cortical development may play a critical role in vulnerability to SZ. The candidate schizophrenia risk gene DGCR2 regulates early steps of corticogenesis.